10 Billion App Store downloads! It might seem incredible but Apple will shortly announce the 10 billionth app download since they started the service in 2008. 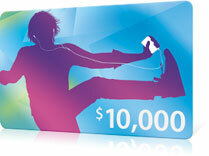 They are offering a $10,000 iTunes Gift Card to the user who downloads the ten billionth app, demonstrating just how successful the service has been in that short time. Apple allows 70% of revenues from the store to instantly go to the seller of the app, and 30% go to Apple. The average revenue for publishers (for each app) is around £450, so it’s not hard to work out just how profitable the business model is. For my clients this means an app is a viable proposition for greater visibility and exposure, as well as a useful channel for interaction and new functionality. It also offers potential for an additional revenue stream (for paid apps). The possibilities are endless: for instance recruiters can use apps for job searches and candidate communication, property clients can provide details of deals and location based services, travel clients can push last minute offers and local authorities can engage more effectively with communities. The potential for reaching users is increasing all the time – social media being the quickest way to gain exposure for other digital services. the opportunities for free apps has arrived in the form of basic app production services, thereby enabling all types of businesses to get in on the phenomenon. Get in touch to discuss app production for iOS, BlackBerry or Android.